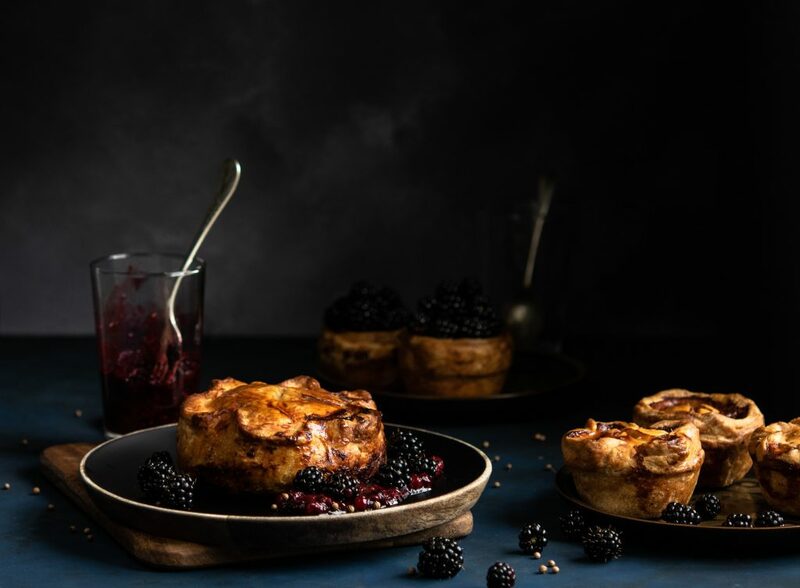 Although Irina grew up in Romania, much of her cooking takes on a British influence, although she likes to remain true to her Romanian roots by marrying the two cultures in her recipes. Having gained inspiration from her mother and famous culinary idols, Irina travels the world in search of new flavours and explores food through the context of history. 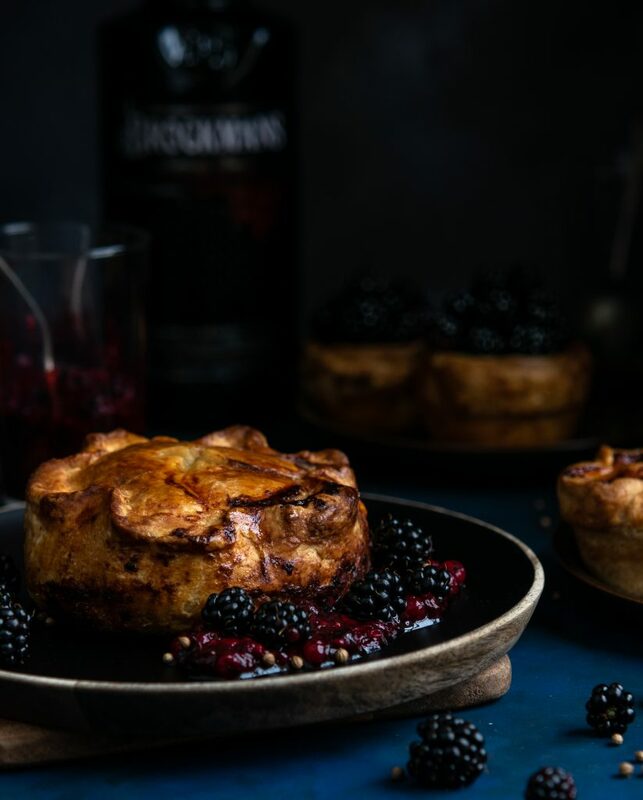 Our game pies pair well with Curious Blue for a richer berry experience and cutting ginger notes. Put the lard, salt and water in a pan. Gently bring to boil until the lard melts. In the meantime, put the flour and eggs in a bowl, and pour over the hot liquid. Stir vigorously with a wooden spoon, or use the paddle attachment if using a mixer. When the mixture resembles a paste, cover the bowl with greaseproof paper and leave to rest for 2 hours. It needs to be cool enough to be handled safely, but still workable. Turn the dough onto a lightly floured surface and roll it to roughly 4-5cm in thickness. Using a pastry cutter just a little larger than the muffin tin circles, cut 12 round shapes. Then roll again, and using a pastry cutter one size smaller than the previous one, cut another 12 circles (they will be the pie lids). Whilst the pastry is resting in the fridge, you can make the filling. Cut the ready diced game meat into smaller pieces, then add them to the minced pork. Add the herbs and spices. Mix well, then set aside. Pre-heat the oven to 180C. Grease the muffin tin with a little butter. Take the larger pastry circles and push them into each tin. Press with your fingers, or with a little leftover dough wrapped in cling film. Make sure they follow the tin’s shape. Take a little bit of the mixture and fill each pastry case 3 quarters full. Lightly brush the edges with egg wash. Now take the smaller circles and place them on top of each pastry case. Bring the edges together and crimp them. Don’t be afraid to stretch the top to meet the sides. Make sure that they are sealed together, then brush with a little more egg wash. Make a cross in the middle (to let the steam escape during baking). Now place in the fridge for 30 minutes. After baking, take them out of the oven and carefully remove from the tins (be careful not to burn yourself). Lightly brush the sides of each pie with the leftover egg wash and return to the oven on a baking sheet (not in the muffin tin). Bake for another 8 minutes. Leave to cool for 3 hours. Make the gelatine: soak the leaves in a bit of cold water for 5 minutes. In the meantime, heat the chicken stock, but don’t allow it to boil. Squeeze the excess water out of the gelatine leaves, and add to the stock. Stir well until totally dissolved, then set aside for another 5-6 minutes. Pour in the jelly: when the pies are completely cool, use a little funnel to pour the warm jelly into each pie. Then put in the fridge for at least 8 hours or overnight. 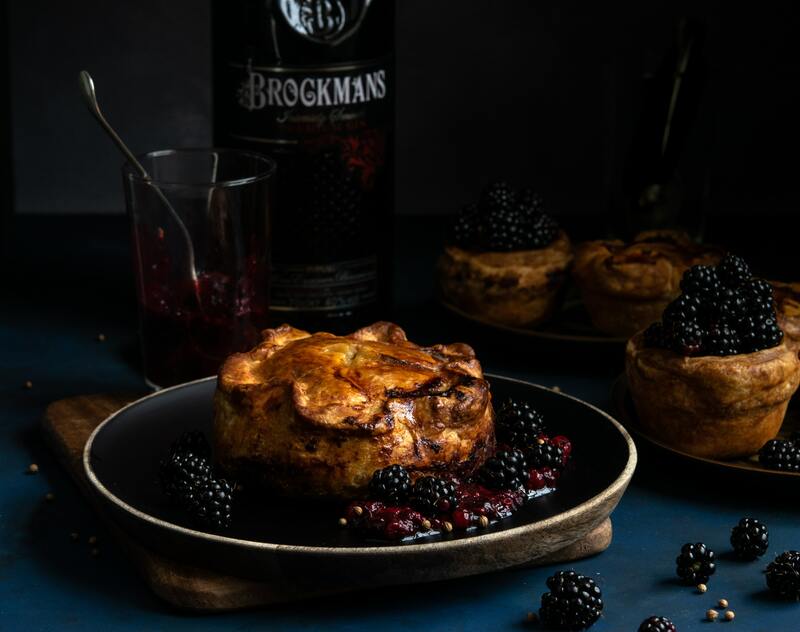 Serve cold, with the berry and Brockmans Gin sauce. Bring the berries and water to a simmer, stirring occasionally until the berries are soft. Pour in 50ml Brockmans Gin and simmer for another 8-10 minutes. 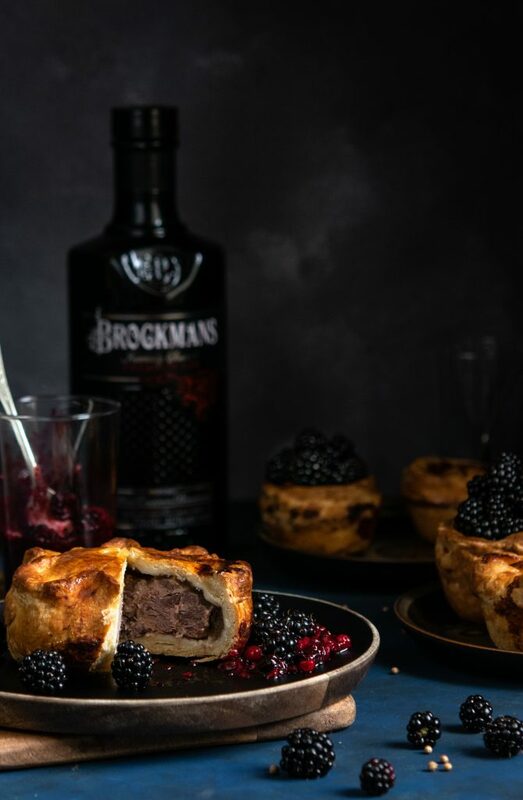 For those who like a rustic sauce, set aside the pan to cool down and add the rest of the 25ml Brockmans Gin. When ready to serve, just warm gently, but do not allow it to boil. For those who like a smooth, seedless sauce – take the pan off the heat and pass the sauce through a sieve, pressing down with a spoon to squeeze out all of the juices. 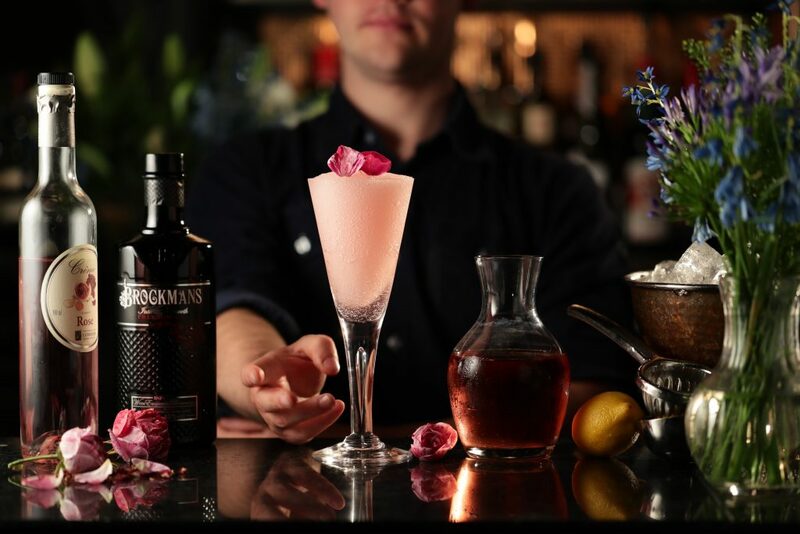 Then add the remaining 25ml Brockmans Gin. When ready to serve, just warm it gently, but again, do not allow it to boil.